Your cable Internet is about to speed up -- a lot. Historically, consumers have had limited options for home Internet, mainly over existing cable or phone lines. Although fiber deployments have been offering consumers gigabit speeds in the past year or so, it's not widely available. That will soon change as a number of service providers have announced new gigabit services in more than 150 communities in the US. Later this year, cable companies will have the tools to offer those same gigabit speeds quickly and easily through DOCSIS 3.1 -- and without tearing up the streets. In an era where consumers demand both high-quality broadcasts and high-bandwidth streaming television content, real-time interactive gaming, and remote home monitoring, DOCSIS 3.1 brings nearly a 100x increase in the average data rate to the home. This will eventually give consumers streaming content, such as Netflix, the kind of bandwidth needed to stream Ultra HD content to multiple screens and download an entire 14GB digital movie in less than two minutes. What's more, DOCSIS 3.1 offers two very significant benefits to cable operators. First, DOCSIS 3.1 is 25% more efficient than earlier versions of DOCSIS. This translates to hundreds of megabits more bandwidth, without making any changes to the network. Perhaps more importantly, the new standard results in higher capacity to those networks that were already 100% utilized. Until recently, DOCSIS standards used single-carrier, quadrature amplitude modulated (QAM), 6MHz- and 8MHz-wide channels. With 64 QAM or 256 QAM specified for the downstream, this translates to data rates of 30.34 to 42.88 Mbit/s, respectively. To increase throughput, DOCSIS 3.0 introduced the concept of channel bonding. With DOCSIS 3.1, the concept of "channels" goes away entirely. 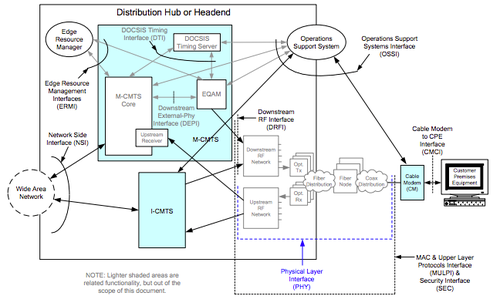 For instance, CableLabs reworked the DOCSIS physical layer (PHY) to use orthogonal frequency division multiplexing (OFDM) in cable. OFDM works by encoding data on multiple subcarriers to greatly increase spectral efficiency and reduce interference and signal loss. By fully optimizing spectrum, a 50% improvement in throughput can be achieved for a given frequency range. While this is huge, DOCSIS 3.1 also widens both the upstream and downstream available bandwidth, with the potential to use the full available spectrum found in the cable environment. A stipulation is that both the network infrastructure and home cable modems must each support a minimum of two independently configurable OFDM channels, each occupying a spectrum of up to 192MHz in the downstream. The minimum modulated bandwidth is 22MHz, and the maximum modulated bandwidth is 190MHz, with each subcarrier having either 25kHz- or 50kHz-wide narrowband spacing. This means there are 7680 25kHz subcarriers or 3840 50kHz subcarriers within the allowed 190 MHz. Two 96MHz-wide channels are assigned for the upstream, using orthogonal frequency division multiple access (OFDMA). OFDMA is a variation of OFDM that assigns carrier subsets to individual users. The key is that the parameters of each channel can be independently configured to optimize the channel based on channel conditions. So, if there's interference at a certain frequency, that can be "notched" out and excluded from the transmission path. Of course, the levels of modulation also increase, up to 4096-QAM in either direction. Where 64 QAM provided 6 bits of information per symbol, 4096 now provides 12 bits per symbol. But what if the data path isn't fully characterized or there's spontaneous interference or signal loss or decay for other reasons? That's where another major DOCSIS 3.1 PHY innovation comes into play: low-density parity check (LDPC) forward error correction (FEC) coding. Almost all communications systems implement some means of detecting and recovering from an error. To date, DOCSIS has relied upon Reed-Solomon encoding, but for DOCSIS 3.1 it switched to LDPC. This increases the ability to recover signals in a noisy environment by in essence adding more redundant bits. Together with frequency and time interleaving, DOCSIS 3.1 has the one-two punch of both avoiding and compensating for the loss of data. Operators such as Comcast Corp. (Nasdaq: CMCSA, CMCSK) and Liberty Global Inc. (Nasdaq: LBTY) have already embraced DOCSIS 3.1 with plans to deploy it live and in the field this year, with broad-scale deployment in 2016. That said, the benefits for gaming and simultaneous video streams are just the tip of the iceberg. Look out for holographic displays, life logging, and ideas yet to be imagined.